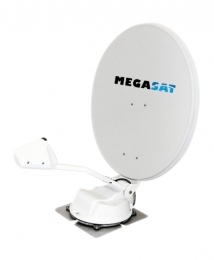 The Megasat Campingman GPS is the latest fully automatic dish Megasat. The dish has a GPS location determination making the dish even faster and more accurate aiming on the desired satellite. This allows you to enjoy optimum picture quality. The Megasat Campingman GPS is a height of 35CM. The low height is perfect for this dish on your RV or camper. Also on the water you can enjoy this dish satellite television. The dish is available in both single and twin versions. The twin models can be connected to two digital receivers or a twin tuner. We offer an installation service for customers in the DARLINGTON, YARM, CROOK, BARNARD CASTLE, CATTERICK, WINGATE, NEWTON AYCLIFFE, CORNFORTH, MIDDLETO SAINT GEORGE, HURWORTH-ON-TEES and DURHAM areas.